No matter how high a bird flies, it has to come down for water. The Common Black Hawk (Buteogallus anthracinus) is a bird of prey in the family Accipitridae, which also includes the eagles, hawks and Old World vultures. 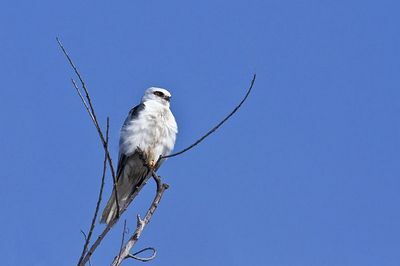 The Mangrove Black Hawk, traditionally considered a distinct species, is now generally considered a subspecies, subtilis, of the Common Black Hawk. The Common Black Hawk feeds mainly on crabs, but will also take small vertebrates and eggs. This species is often seen soaring, with occasional lazy flaps, and has a talon-touching aerial courtship display. The Common Black Hawk is a breeding bird in the warmer parts of the Americas, from the southwestern U.S. through Central America to Venezuela, Peru, Trinidad and the Lesser Antilles. The Common Black Hawk is a mainly coastal, resident bird of mangrove swamps, estuaries and adjacent dry open woodland, though there are inland populations, including a migratory population in northwestern Mexico and Arizona. Birds of prey do not flock together. We need reader submitted bird sayings, bird quotes, bird poems, bird quotations, or your own bird quote. Click Submit on the menu and enter the bird quotation for others to enjoy. a bird flies, bird proverb, bird quote, bird quotes. Bookmark.